The Lockheed C141 Starlifter was a vital member of the US Air Force. It was the first strategic jet-powered transport to land in the Antarctic and to transport US Army paratroopers during critical missions. A flexible airlift aircraft, it allowed for the hauling of large cargo and troop loads for comparatively longer distances. The C141 Starlifter performed airlifting of combat forces, resupplying them, and extracting the wounded from the battlefield with relative ease. It injected combat forces through airland or airdrop, using a rear loading ramp and paratroop doors on either side. The C141 Starlifter can also fly in low altitudes and comes in handy when there is a need to deliver equipment and supplies via the container delivery system. It is the staple aircraft for paratroopers, fulfilling a host of airlift requirements with its ability to travel long distances. Beef up your desktop model aircraft collection with the C141 Starlifter. This model of the reliable airlift aircraft of the Air Mobility Command is the perfect addition to your collection. 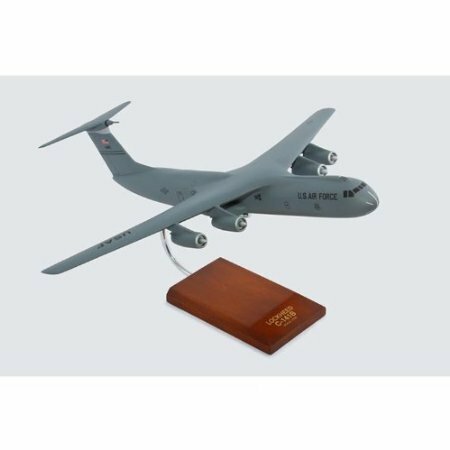 With its elegant wooden base and carefully etched nameplate, the Lockheed Starlifter will definitely be a familiar sight to model airplane enthusiasts and war veterans alike. Display it in your home or office today and reap the benefits of having the Starlifter in your collection.